After a near-perfect operating recovery in FY18 from the perfect storm of the prior year, FY19 holds a host of growth challenges given high base effects of Indonesian poultry and the threat of African Swine Flu (ASF) in Vietnam. That said, the sharp c20% price downturn of the past month is overdone in our view as industrialised farmers like JAPFA LTD. (SGX:UD2) are far better positioned to handle ASF risks while growth outlook in its key markets remain strong. We trim FY19E/FY20E PATMI by 5%/4% but raise Target Price 6% to SGD1.05 from rolling forward to FY19 our EV/EBITDA based SOTP. 4Q18 results wrapped up a near-perfect recovery year with stellar performance from both animal feed and commercial farm operations in Indonesia poultry and Vietnam swine. Meanwhile, China dairy continued to see productivity improvements. Only Consumer food performed worse than expected but this is still a relatively small revenue contributor. Going forward, it is unlikely that the exceptionally high margins enjoyed in Indonesia poultry breeding and commercial farms can be sustained and we expect a y-o-y downward normalisation by 3-5ppt. In Vietnam, elevated pork ASPs are not so much a concern as a hard-to-forecast wild card event like ASF affecting its commercial stock. While short term cyclical volatility is inherent to the agribusiness sector, Japfa will continue to benefit from long term secular consumption growth trends with operations in populous, high-growth emerging economies of Indonesia, Vietnam, Myanmar, India, and China where per capita protein consumption is still low as is penetration levels of industrialised farming. Some mitigating factors to the FY18 high base could be Indonesia election driven demand, IDR strength and y-o-y softer soybean meal price. 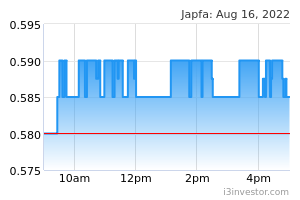 Japfa trades at a core FY19E P/E of just 8.4x, a material discount to the 20x+ witnessed for peer baskets of upstream APAC feed and protein producers and China dairy firms. Excluding its stake in listed subsidiary PT Japfa Tbk (JPFA IN; IDR2,250), its stub FY19E P/E is negative for the other businesses that should generate cUSD50m in profit this year. In Indonesia, feed and commercial farm volumes are expected to grow at mid-single-digit levels but ASPs are likely to decline y-o-y with increasing supply. We expect average margins in breeding and commercial farms to moderate down 3-5ppt from the exceptionally high levels in FY18. In Vietnam, feed volumes are expected to grow high single-digit and commercial farm volumes by mid-single digit. ASPs at both are assumed to remain relatively unchanged. Myanmar is expected to see mid-single digit overall volume growth (DOC and broilers) but given the current state of competition in the industry, it is unlikely to revert to profitability. India feed volumes expected to grow 3-5% after a solid c17% growth in FY18 driven by increased customer penetration/market share gains. Overall, we expect the poultry business to see a c15-20% y-o-y profit decline in FY19 mainly from PT Japfa Tbk witnessing a normalisation of ASPs and margins from an exceptionally high base in FY18. Our base case assumes 2% volume growth in both feed and commercial farms, and pork prices will likely remain in the cVND44K-48K range. Our base also assumes that Japfa commercial farms are not affected by ASF given the company’s stringent biosecurity practises and remote locations of most farms from urban areas. However the Vietnam swine market faces a somewhat complex year with the reported ASF cases in early Feb. We expect to see sporadic incidents of ASF that will reduce stock to the market. The wild card is if ASF becomes widespread amongst backyard farmers (as has been the case in certain provinces in China) – in such a scenario pork prices are likely to spike up by more than 15-20% due to supply shortages. Japfa management indicated that in a bear-case stress scenario where some 20% of commercial stock in their farms is affected by ASF, the impact to profit is estimated at cUSD20-22m (without assuming change in pork prices). But in reality, pork prices will likely spike with a supply shortage and the key metric in such an environment is availability of stock to sell. An industrialised farming company like Japfa also mitigates stock exposure risk to bio-threats with geographic diversification – its swine parent stock farms are spread out across 22 locations and it has over 300 company and contract fattening farms. We forecast raw milk sales volume as well as ASP growth of c2%. Volumes growth will be driven by continued productivity improvements. The weakening EUR:RMB exchange rate in 2H18 has led to some ASP stabilisation after a prolonged period of decline due to European imports flooding the market; we expect this stabilisation to continue into FY19. We expect the business to continue to be loss-making as Japfa tries to consolidate its position against intense price competition in the market. We forecast USD15m in losses and a turnaround to the black to be three years away. ASF is the key area of current concern for the swine industry globally. It has been difficult to contain its’ spread in China for almost a year now and farms in numerous provinces have been affected. Elsewhere, outbreaks in Belgian farms have resulted in neighbouring France seeking help from its military for logistical support in culling wild boars at the Belgium – France border, while Denmark is building a fence along its border with Germany to protect its livestock industry. Vietnam’s cause for concern is justified given the somewhat porous borders in Southeast Asia and the tribal / rural populations that live in these border regions that could potentially transmit the disease into Vietnam. We have made a number of minor adjustments to our FY19E/FY20E profit forecasts following the 4Q18/FY18 results and recalibrated our ASP and volume expectations for the various business units. The net impact is a 5%/4% reduction in profit estimates for the two years, the lion’s share of which stems from increases in marketing and admin expenses, as well as an increase in finance charges driven by upward revisions to capex and higher working capital requirements. Our target price estimate has been revised up 6% from SGD0.99 to SGD1.05 from the various forecast adjustments and from rolling forward our SOTP based valuation EBITDA multiples to end-2019. Japfa’s sub 1Y forward P/E indicates that the market is not attributing any value whatsoever to the businesses outside of its holding stake in listed subsidiary PT Japfa Tbk. We forecast these business units to collectively generate cUSD50m in profit in FY19. The forward stub P/E multiple is negative and close to an all-time low in its listing history. Japfa is also likely to be the cheapest upstream food stock on a P/E basis in the APAC region trading at 8.4x FY19E versus peer averages of over 20x witnessed for APAC feed and animal protein and China dairy companies.